Fresco Murals: Interior/Exterior Wall Paintings. in Padua (1303-10) By Giotto. Christian art of the Trecento. the altar wall of the Sistine Chapel. of the 16th century by Michelangelo. In fine art, a mural is a painting on a wall or ceiling. Usually, it is either applied directly onto the surface, or painted on a canvas which is then fixed or cemented onto the wall. More rarely, it is painted onto panels that become part of the wall. Aside from the technical problems posed by the wall, there are numerous artistic issues to be overcome. To begin with, the mural painter needs to consider the viewpoint or angle from which his painting will be seen. While canvases are typically hung at or around eye-level, a mural is likely to be seen from several different angles. If so, there may be complex problems of perspective that need to be resolved. The wall painting should be flat and executed in matt paint, so that it can be viewed from different points and at any time of the day, without the glare of reflected light. In addition, it must be permanent, and it should suit its architectural environment and frame. Throughout classical antiquity, the Renaissance and Baroque eras and for centuries afterward, fresco was the traditional medium for murals. That said, from the 16th-century onwards, mural painters also used oil on canvas which was then fixed to the wall surface. The extra convenience was often cancelled out by a dullness of colour and more rapid deterioration. Today, while fresco still gives the best results, especially for indoor wall paintings, murals are mostly painted in oils, tempera or polymer colours. Note: Fresco is a method, where paint is applied onto freshly plastered walls or ceilings. There are three variants. "Buon" fresco involves painting in pigment combined with water on a thin layer of wet plaster, or lime mortar. "A Secco" fresco involves using dry plaster, except in this case a binding medium, like egg, glue or oil is needed to fix the pigment into the plaster. "Mezzo-fresco" involves painting onto almost-dry plaster - traditionally defined as firm enough not to leave thumb-prints - in a way that the colour pigments only penetrate slightly into the drying plaster. By the end of the 16th century this method had mostly replaced the buon fresco technique. With the growth of the urban landscape, and a corresponding rise in graffiti art, as well as political pressure groups, mural pictures on exterior walls in cities are becoming increasingly common. They too pose specific problems for the mural designer. Few surface paints exist with the durability required for outdoor murals, even in relatively dry climates. Which is why exterior wall paintings traditionally have been executed in coloured cement, mosaic tesserae (glass/ceramic), or tiles made out of terra cotta (See also the Portuguese Azulejo tile frescoes). Nowadays, outside murals which are painted directly onto walls can be protected with numerous layers of varnish or acrylic glaze. Alternatively, murals can be painted onto canvas or other types of ground and then applied to the final surface. Computer assisted techniques are also available, such as Frescography, a digital manufacturing method (CAM) created by Rainer Maria Latzke. The first mural designers were prehistoric cavemen who decorated their caves with a wide variety of cave painting. Famous examples can be seen at Chauvet Cave, Vallon-Pont-d'Arc, France (30,000 BCE); Lascaux Cave, Montignac, Dordogne, France (17,000 BCE) and Altamira Cave, Santillana del Mar, Spain (15,000 BCE), known as "the Sistine Chapel of Prehistoric Art". Murals were among the most popular types of art in all classical civilizations, including those of Ancient Egypt (tombs), Minos (palaces), Ancient Greece (temples, domestic houses), Etruria (funeral art) and Ancient Rome (public institutions, domestic houses). (See also: Greek Mural and Panel Painting.) However, judging by the standard of murals found in houses excavated at Pompeii, Roman mural painters were little more than interior decorators. Murals were also a popular form of early Christian art, notably in the catacombs outside Rome. Following the collapse of Rome in the 5th century, mural art disappeared from Europe altogether for several centuries, surviving only in Constantinople, the capital of the Eastern Roman Empire. The finest murals of Byzantine art, however, appeared as mosaic art in churches and mosques such as the Hagia Sophia (Constantinople), Ravenna Cathedral, St Mark's Cathedral Venice and others. (See also: Ravenna Mosaics.) Mural art also became popular in 10th century Kiev, where it was an important form of Russian medieval painting. For the top muralists and wall painters in Russia, see: Theophanes the Greek (c.1340-1410), Andrei Rublev (c.1360-1430), and Dionysius (c.1440-1502). In western Europe, meanwhile the 11th and 12th centuries witnessed a major revival of murals during the period of Romanesque painting (c.1000-1200). For details of national styles see: Romanesque Painting in France and the more Islamic oriented Romanesque Painting in Spain. The decline of Constantinople and the rise of the Renaissance in Florence, financed by the Medici family and others, led to an explosion of magnificent mural paintings, during the 14th, 15th and 16th centuries, of which the most famous examples are as follows. In the East, India had a rich tradition of mural painting. See, for instance, Classical Indian Painting (up to 1150 CE) and Post-Classical Indian Painting (14th-16th Century). 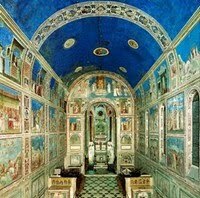 Scrovegni (Arena) Chapel Frescoes (c.1303-10) Padua, by Giotto. Brancacci Chapel Frescoes (1424-8) Florence, by Masaccio. Camera degli Sposi Frescoes (c.1474) Mantua, by Andrea Mantegna. The Last Supper (1490, Santa Maria Convent, Milan) by Leonardo. Sistine Chapel Frescoes, Rome, by Michelangelo. Genesis Fresco (1508-12, ceiling of Sistine Chapel) by Michelangelo. Raphael Rooms (c.1508-20, Stanze di Raffaello) decorated by Raphael. School of Athens (1509-11, Stanza della Segnatura) by Raphael. Miracles of St Filippo Benizzi (1509-10, SS Annunziata) by Andrea del Sarto. Assumption of the Virgin (Parma Cathedral) (1530) by Correggio. The most famous examples of Mannerist mural painting, included the celebrated Last Judgment Fresco (1536-41, altar wall of Sistine Chapel) by Michelangelo, and the wall paintings produced at the Fontainebleau School, by Francesco Primaticcio (1504-70) and Rosso Fiorentino (1494-1540) and others. NOTE: See also the hugely influential classical wall paintings known as the Farnese Gallery frescoes (1597-1608), by Annibale Carracci. - Allegory of Divine Providence (1633-39), by Pietro da Cortona. - Apotheosis of St Ignatius (1688-94) San Ignazio, Rome by Andrea Pozzo. These Baroque masterpieces were a compelling feature of the Vatican's (and the Jesuits') campaign of Catholic Counter-Reformation Art (c.1560-1700). The finest example of Rococo style wall painting - painted by the great Venetian artist Giambattista Tiepolo (1696-1770) - can be seen in the Wurzburg Residenz of Prince Bishop Karl Philipp von Greiffenklau. Highlights include the dramatic painting of Apollo Bringing the Bride (1750-1) in the centre of the Trepenhaus ceiling. This work effectively brought to a close the Italian tradition of mural art. The walls of notable public buildings have proved irresistible to painters throughout the ages, including the modern age. During the period 1819-23, at his farmhouse studio known as Quinta del Sordo (the "Villa of the deaf man") - situated on the banks of the Manzanares river near Madrid, Goya painted a series of murals known as the "Black Paintings", including the disturbing "Saturn Devouring his Son" (Prado Museum, Madrid). Daniel Maclise (1806-70) was physically exhausted by his frescoes for the the walls of Westminster Palace; John Singer Sargant was artistically worn down by the murals he composed for the Boston Public Library and the Widener Memorial Library at Harvard. The Spanish Impressionist Joaquin Sorolla Y Bastida (1863-1923) died less than 12 months after his 9-year stint on murals for The Hispanic Society of America, in New York. However, some artists thrive on murals, notably the eminent French painter Puvis de Chavannes (1824-98), who made his reputation by decorating several public buildings in Paris, such as the Pantheon, the Sorbonne and the Hotel de Ville. Even so, wall painting during the modern era includes two notable highpoints. First, the Mexican murals of Diego Rivera (1886-1957), David Alfaro Siqueiros (1896-1974) and Jose Clemente Orozco (1883-1949), which led to a revival of public fresco painting in Mesoamerica. This movement influenced the use of murals in America by the Social Realism school, during the 1930s and 40s, notably by the socially aware painter Ben Shahn (1898-1969). These American mural decorations - mostly for public buildings - were commissioned by the Federal Arts Project. Second, the upsurge in Graffiti art (Street or Aerosol Art), which blossomed especially in America - Philadelphia, then New York - where it morphed into a major type of urban contemporary art. The most famous New York street graffiti muralists include Jean-Michel Basquiat (1960-88), Keith Haring (1958-90) and David Wojnarowicz (1954-92) - later joined in the 1980s by mural artists like Graham Rust and Rainer Maria Latzke, and in the 1990s by Banksy - now believed to be Robert Banks, or Robin Gunningham. Major exhibitions of "Street Art" were held at The Tate Gallery London (2008) and the Grand Palais in Paris (2009).  For more about wall painting techniques, see: Homepage.